As the weather heats up many families will cool down by swimming at pools, rivers, lakes, ponds and the ocean. But a new report from Safe Kids Worldwide offers a warning about drowning: families need to pay more attention to swimming safety — especially in open water. "We used to hear a lot about kids drowning in pools and there has been a fair amount of work done in that area, and we have seen those drownings decrease," Morag Mackay, director of research at Safe Kids Worldwide, told TODAY. "But drownings in open water have increased." 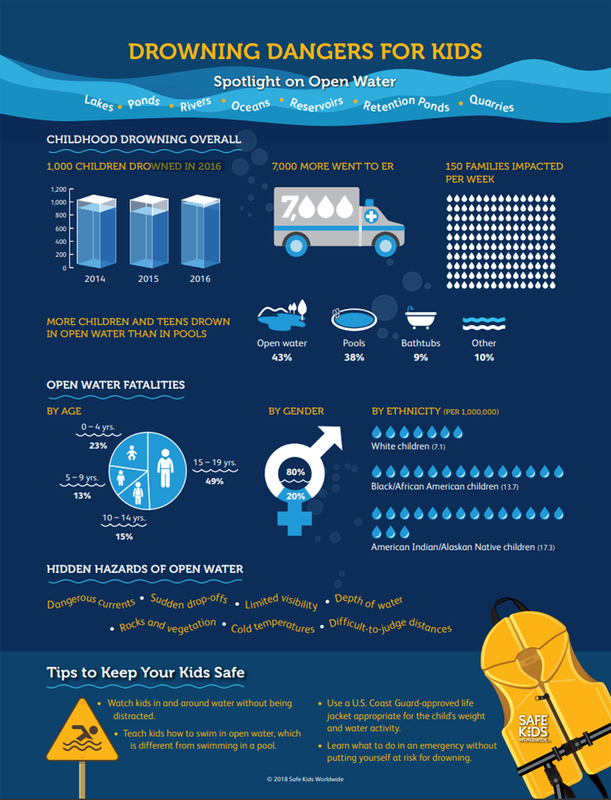 The report — Hidden Hazards: An Exploration of Open Water Drowning and Risks for Children — finds that 43 percent of drowning occur in open water, such as quarries, oceans, lakes, rivers, retention ponds, reservoirs and ponds. Drowning in pools makes up 38 percent of drownings. In total in 2016, 1,000 children from infancy to age 19 drowned, the highest number of drowning fatalities since 2011. On top of that, more than 7,000 children visited an emergency room because of a near-drowning. At least 80 percent of children who drown in open water are boys; half of all open water fatalities are teens, age 15 to 19. "We socialize boys to take more risks and therefore that is part of it," Mackay said. "We may supervise slightly different based on the gender of the kids." The report also notes that African American and Native American children and teens are at an increased risk of drowning deaths. "We see racial disparities in swimming ability and access to swim lessons," Mackay said. "Something that society can do is really look at where opportunities are for kids learning how to swim." While learning how to swim reduces the risk of drowning and near drownings, the report encourages parents to be mindful of the differences between pool and open-water swimming. For safer open water swimming the organization recommends teaching open water swimming, as well as pool swimming, and having a designated "watcher" who keeps an eye on swimmers the whole time they're in the water. "Persistent coughing or coughing associated with increased work of breathing" should be brought to the attention of a medical personnel -- if not immediately -- said Parents.com. The child will be gasping or coughing for air. He or she may feel like they can't catch their breath. Vomiting can sometimes be triggered by persistent coughing. It's also a "sign of stress from the body as a result of the inflammation and sometimes a lack of oxygen," said pediatrician Kathleen Berchelmann to Parents.com. An enhanced state of confusion or exhaustion may be a result of the brain's lack of oxygen. Don't just put your child down for a nap -- be wary of these symptoms. Chest pain could be associated with extreme coughing or vomiting.